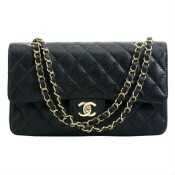 Hire prestigious premium designer handbags. 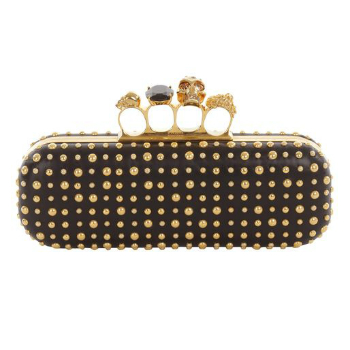 Glamorous black nappa leather knucklebox Alexander McQueen clutch bag with all-over mixed-sized bubble stud details and gold finish hardware. The Swarovski crystal rings clasp closure opens nappa leather interior. Easy and safe to carry in your hand. 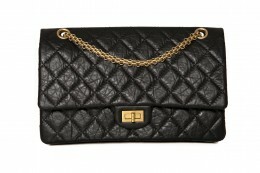 You will shine with this luxurious Alexander McQueen clutch bag. Deposit required. Product Attributes: Alexander McQueen, Clasp Closure, Clutch, Gold Hardware, Golden, Iconic, KnuckleBox, Leather, Nappa Leather, Rings, Studded, Swarovski Crystals. This bag is not yet available to hire but is a 'Wishlist' item. If you would be interested in hiring this bag please click the button above and we will notify you as soon as it becomes available. 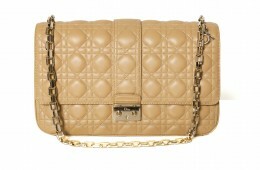 Be the first to review “ALEXANDER McQUEEN” Click here to cancel reply.